Saint Nicholas of Myra [lower-alpha 1] (traditionally 15 March 270 – 6 December 342),   [lower-alpha 2] also known as Nicholas of Bari, was an early Christian bishop of the ancient Greek maritime city of Myra in Asia Minor (Ancient Greek : Μύρα, modern-day Demre, Turkey) during the time of the Roman Empire. He is revered by many Christians as a saint. Because of the many miracles attributed to his intercession, he is also known as Nicholas the Wonderworker. [lower-alpha 3] Saint Nicholas is the patron saint of sailors, merchants, archers, repentant thieves, children, brewers, pawnbrokers, and students in various cities and countries around Europe. His reputation evolved among the faithful, as was common for early Christian saints, and his legendary habit of secret gift-giving gave rise to the traditional model of Santa Claus ("Saint Nick") through Sinterklaas. 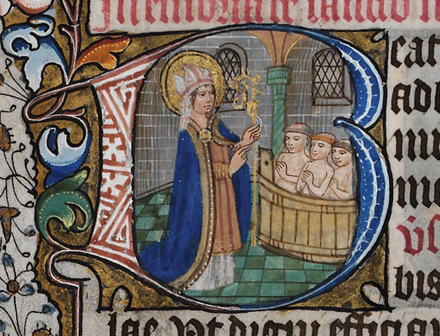 Very little is known about the historical Saint Nicholas. The earliest accounts of his life were written centuries after his death and contain many legendary elaborations. He is said to have been born in the Greek seaport of Patara, Lycia in Asia Minor to wealthy Christian parents. In one of the earliest attested and most famous incidents from his life, he is said to have rescued three girls from being forced into prostitution by dropping a sack of gold coins through the window of their house each night for three nights so their father could pay a dowry for each of them. Other early stories tell of him calming a storm at sea, saving three innocent soldiers from wrongful execution, and chopping down a tree possessed by a demon. In his youth, he is said to have made a pilgrimage to Egypt and the Palestine area. Shortly after his return, he became Bishop of Myra. He was later cast into prison during the persecution of Diocletian, but was released after the accession of Constantine. An early list makes him an attendee at the First Council of Nicaea in 325, but he is never mentioned in any writings by people who were actually at the council. 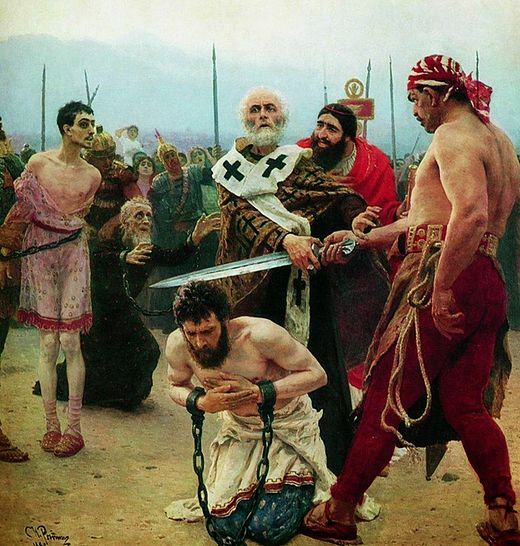 Late, unsubstantiated legends claim that he was temporarily defrocked and imprisoned during the Council for slapping the heretic Arius. Another famous late legend tells how he resurrected three children, who had been murdered and pickled in brine by a butcher planning to sell them as pork during a famine. Patara, later renamed Arsinoe (Ἀρσινόη), was a flourishing maritime and commercial city on the south-west coast of Lycia on the Mediterranean coast of Turkey near the modern small town of Gelemiş, in Antalya Province. It is the birthplace of St. Nicholas, who lived most of his life in the nearby town of Myra (Demre). Lycia was a geopolitical region in Anatolia in what are now the provinces of Antalya and Muğla on the southern coast of Turkey, bordering the Mediterranean Sea, and Burdur Province inland. Known to history since the records of ancient Egypt and the Hittite Empire in the Late Bronze Age, it was populated by speakers of the Luwian language group. Written records began to be inscribed in stone in the Lycian language after Lycia's involuntary incorporation into the Achaemenid Empire in the Iron Age. At that time (546 BC) the Luwian speakers were decimated, and Lycia received an influx of Persian speakers. Ancient sources seem to indicate that an older name of the region was Alope. St. Nicholas Church is a museum and an ancient Byzantine Greek Church located in modern-day town of Demre, Antalya Province, Turkey. 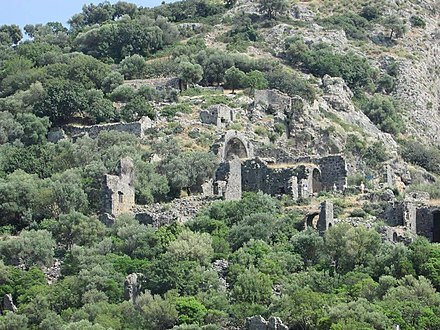 Its usage is dated from its 6th century construction until its final abandonment in 1923, when the remaining Greek natives of Demre were required to leave by the Population exchange between Greece and Turkey. It is notable for being the burial place of St. Nicholas of Myra, a 4th-century Greek Christian bishop of the ancient city of Myra, an important religious figure for Eastern Orthodox Christians and Roman Catholics and the historical inspiration for Santa Claus. The Church is on UNESCO's tentative list to become a World Heritage Site. Procopius of Caesarea was a prominent late antique Byzantine Greek scholar from Palaestina Prima. Accompanying the Byzantine general Belisarius in Emperor Justinian's wars, Procopius became the principal Byzantine historian of the 6th century, writing the History of the Wars, the Buildings, and the Secret History. He is commonly classified as the last major historian of the ancient Western world. Theodoret of Cyrus or Cyrrhus was an influential theologian of the School of Antioch, biblical commentator, and Christian bishop of Cyrrhus (423–457). He played a pivotal role in several 5th-century Byzantine Church controversies that led to various ecumenical acts and schisms. He wrote against Cyril of Alexandria's 12 Anathemas which were sent to Nestorius and did not personally condemn Nestorius until the Council of Chalcedon. His writings against Cyril were included in the Three Chapters Controversy and were condemned at the Second Council of Constantinople. Some Chalcedonian and East Syriac Christians regard him as a "full" saint. Although the Eastern Orthodox Protopresbyter Michael Pomazansky repeatedly refers to him as "Blessed", there is no evidence in his work that this is the official position of any Eastern Orthodox jurisdiction. Historiae Ecclesiasticae Tripartitae Epitome, the abridged history of the early Christian Church known as the Tripartite History, was the standard manual of Church history in Medieval Europe. Colobraro is a town and comune in the province of Matera, in the southern Italian region of Basilicata. The town is positioned on a high hill dominating the valley of river Sinni near the town of Valsinni. Saint Nicholai's icon labels the light house at the tip of the outskirt pier of the Port of Varna. Saint Nicholai is patron saint of sailors, fishermen, ships and sailing. In centuries of Greek folklore, Nicholas was seen as "The Lord of the Sea", often described by modern Greek scholars as a kind of Christianised version of Poseidon. Arsenije Sremac was the second Archbishop of the Serbian Orthodox Church (1233–1263) and a disciple of Saint Sava of Serbia. 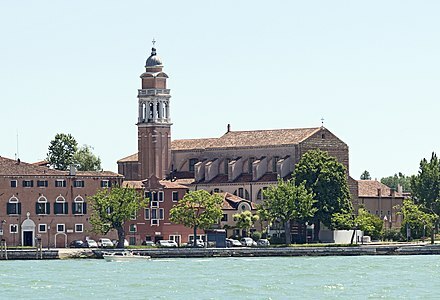 San Nicolò al Lido refers to both the San Nicolò Church and most importantly to its annexed Monastery of San Nicolò located in Venice, northern Italy. It is located in the northern part of the Lido di Venezia and houses the relics of Saint Nicholas, patron of sailors. From this church, the traditional thanksgiving mass of the Sposalizio del Mare is celebrated. The complex houses monks of the Franciscan order. Metropolitan Philaret was the first hierarch of the Russian Orthodox Church Outside Russia from 1964 until his death on November 21, 1985. The Translation of the Relics of Saint Nicholas from Myra to Bari is a religious and folk holiday among the East Slavs and, to a lesser extent, the South Slavs and Eastern Romance peoples. It is celebrated on May 9 each year. For Old (Julian) Calendar churches, May 9 falls on May 22 of the New (Gregorian) Calendar. 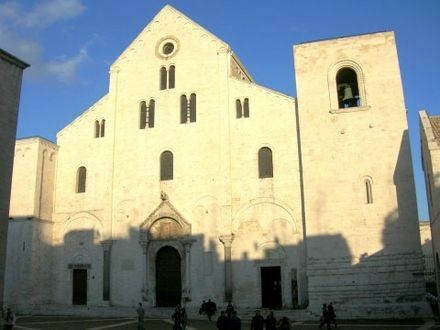 The feast commemorates the translation (movement) of the relics of Saint Nicholas from Myra to Bari, on the Italian Peninsula, to save them from the Turks, who were persecuting Christians and destroying churches and holy objects. 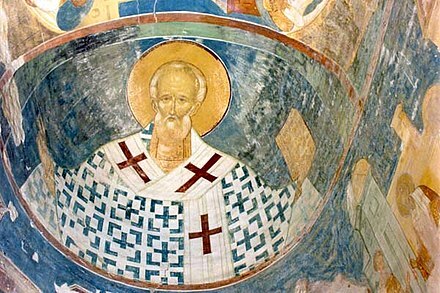 To this day, the relics remain at the Basilica of Saint Nicholas. ↑ Book of Martyrs. Catholic Book Publishing. 1948. ↑ "Serbia". Saint Nicholas Center. Retrieved 4 April 2012. 1 2 Seal 2005, p. 2. ↑ Seal 2005, pp. 2–3. ↑ Lloyd, John; Mitchinson, John (December 2008). The book of general ignorance (Noticeably stouter edition). Faber and Faber. p. 318. ISBN 978-0-571-24692-2. ↑ Cunningham, Lawrence (2005). A brief history of saints. Wiley-Blackwell. p. 33. ISBN 978-1-4051-1402-8. The fourth-century Saint Nikolaos of Myra, Greek Anatolia (in present-day Turkey) spread to Europe through the port city of Bari in southern Italy... Devotion to the saint in the Low countries became blended with Nordic folktales, transforming this early Greek Orthodox Bishop into that Christmas icon, Santa Claus. 1 2 3 4 Collins, Ace (2009). Stories Behind Men of Faith. Zondervan. p. 121. ISBN 9780310564560. Nicholas was born in the Greek city of Patara around 270 AD. The son of a businessman named Theophanes and his wife, Nonna, the child's earliest years were spent in Myra… As a port on the Mediterranean Sea, in the middle of the sea lanes that linked Egypt, Greece and Rome, Myra was a destination for traders, fishermen, and merchant sailors. 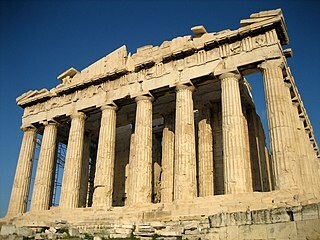 Spawned by the spirit of both the city’s Greek heritage and the ruling Roman government, cultural endeavours such as art, drama, and music were mainstays of everyday life. ↑ Wheeler 2010, pp. vii–x. 1 2 3 4 Seal 2005, pp. 14–15. 1 2 3 Seal 2005, p. 14. 1 2 Wheeler 2010, pp. vii–viii. 1 2 Wheeler 2010, p. viii. 1 2 3 4 5 6 Blacker, Burgess & Ogden 2013, p. 250. 1 2 3 4 Wheeler 2010, p. ix. 1 2 3 4 5 6 Blacker, Burgess & Ogden 2013, p. 251. 1 2 3 Wheeler 2010, p. x. ↑ Seal 2005, p. 15. 1 2 Wheeler 2010, p. xi. 1 2 3 4 5 6 7 8 9 10 11 12 13 14 15 16 17 18 19 20 21 22 23 24 25 26 27 28 29 30 31 32 Lendering 2006, p. Nicholas of Myra. 1 2 3 4 Blacker, Burgess & Ogden 2013, p. 249. ↑ Domenico, Roy Palmer (2002). The regions of Italy: a reference guide to history and culture. Greenwood Publishing Group. p. 21. ISBN 0-313-30733-4. 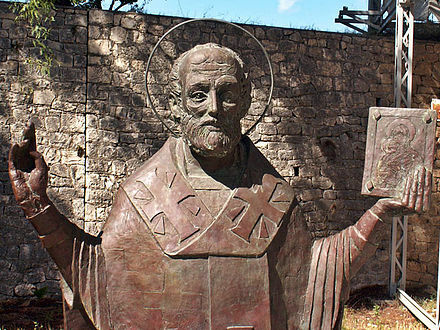 Saint Nicholas (Bishop of Myra) replaced Sabino as the patron saint of the city… A Greek from what is now Turkey, he lived in the early fourth century. ↑ Burman, Edward (1991). Emperor to emperor: Italy before the Renaissance. Constable. p. 126. ISBN 0-09-469490-7. For although he is the patron saint of Russia, and the model for a northern invention such as Santa Claus, Nicholas of Myra was a Greek. ↑ Lanzi, Gioia (2004). Saints and their symbols: recognizing saints in art and in popular images. Liturgical Press. p. 111. ISBN 0-8146-2970-9. Nicholas was born around 270 AD in Patara on the coast of what is now western Turkey. ↑ Lanzi, Gioia (2004). Saints and their symbols: recognizing saints in art and in popular images. Liturgical Press. p. 111. ISBN 0-8146-2970-9. Nicholas was born around 270 AD in Patara on the coast of what is now western Turkey; his parents were Epiphanius and Joanna. 1 2 3 4 5 6 7 8 9 10 11 12 13 14 15 16 17 18 19 20 21 22 23 24 Ferguson 1976, p. 136. ↑ Bennett, William J. (2009). The True Saint Nicholas: Why He Matters to Christmas. Howard Books. pp. 14–17. ISBN 978-1-4165-6746-2. 1 2 3 4 5 6 7 Wheeler 2010, p. 38. 1 2 3 4 Seal 2005, p. 1. 1 2 3 4 5 English & Crumm 2012. ↑ Faber, Paul (2006). Sinterklaas overseas: the adventures of a globetrotting saint. KIT Publishers. p. 7. ISBN 9789068324372. The historical figure that served as model for the Dutch Sinterklaas was born around 270 AD in the port of Patara in the Greek province of Lycia in Asia Minor (present-day Turkey). His Greek name Nikolaos means something along the lines of “victor of the people”. ↑ Blacker, Burgess & Ogden 2013, pp. 249–250. 1 2 3 4 5 6 7 8 9 10 Wilkinson 2018, p. 163. 1 2 3 4 5 6 7 8 9 10 11 12 Lendering 2006, p. Medieval Saint. ↑ Wheeler 2010, pp. 38–39. 1 2 Wheeler 2010, p. 39. ↑ Wheeler 2010, pp. 39–40. 1 2 3 4 Wheeler 2010, p. 40. ↑ Wheeler 2010, p. 41. 1 2 3 4 5 6 7 8 9 10 11 12 13 Greydanus 2016. ↑ Federer, William J. (2002). There Really Is a Santa Claus – History of St. Nicholas & Christmas Holiday Traditions. Amerisearch, Inc. p. 26. ISBN 978-0965355742. ↑ Davis, Leo Donald (1990). The First Seven Ecumenical Councils (325–787) Their History and Theology. Liturgical Press. p. 58. ISBN 0-8146-5616-1. ↑ Wheeler 2010, p. xii. 1 2 Seal 2005, p. 93. 1 2 3 4 Wheeler 2010, p. 35. ↑ "St. Nicholas Center ::: Saint Nicolas". www.stnicholascenter.org. 1 2 3 4 5 6 English 2016, p. 132. 1 2 English 2016, pp. 132–133. 1 2 3 4 5 6 English 2016, p. 133. ↑ Le Saux, Françoise Hazel Marie (2005). A companion to Wace. D.S. Brewer. ISBN 978-1-84384-043-5. 1 2 3 4 5 6 7 8 9 10 11 12 13 Keys 1993. 1 2 3 4 5 6 7 8 9 Jones 1978, pp. 176–193. 1 2 Seal 2005, pp. 135–136. ↑ Seal 2005, p. 135. ↑ "Saint Nicholas". St. John Cantius Parish. Retrieved 25 August 2016. ↑ "Turks want Santa's bones returned". BBC News. 28 December 2009. Retrieved 23 May 2010. ↑ "Santa Claus's bones must be brought back to Turkey from Italy". Todayszaman.com. 28 December 2009. Archived from the original on 11 December 2013. Retrieved 12 December 2013. 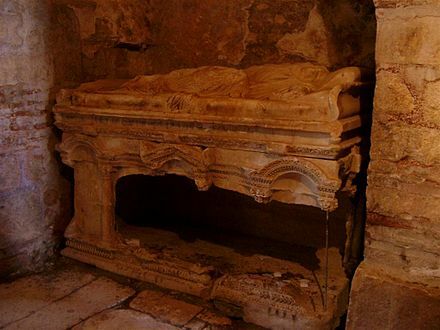 ↑ "Tomb of St Nicholas may have been discovered in Turkey". ir.ishtimes.com. 4 October 2017. Retrieved 7 October 2017. 1 2 3 4 5 6 7 8 9 Cullen 2017. ↑ Seal 2005, p. 101. ↑ Ott, Michael (1907). "Nicholas of Myra". The Catholic Encyclopedia . 11. New York: Robert Appleton Company. ↑ Butler, Albin (1860). Lives of the Saints. 2. ↑ Wheeler, Joe L.; Rosenthal, Jim (2005). "Chapter 1". St. Nicholas: A Closer Look at Christmas. Thomas Nelson. ISBN 9781418504076. 1 2 3 Medrano 2017. 1 2 3 Seal 2005, p. 131. 1 2 Seal 2005, pp. 93–94. ↑ Seal 2005, pp. 100–102. ↑ Seal 2005, pp. 114–115. ↑ Seal 2005, p. 115. ↑ Seal 2005, pp. 115–116. ↑ Seal 2005, pp. 114–116. ↑ Seal 2005, p. 117. 1 2 3 4 5 6 7 8 9 10 11 12 13 University of Oxford 2017. 1 2 3 4 Seal 2005, p. 136. ↑ Seal 2005, pp. 125–127. ↑ Seal 2005, pp. 125–126. 1 2 Seal 2005, p. 127. ↑ Seal 2005, pp. 127–136. ↑ "Ci sono ossa di san Nicola anche a Venezia?" [There are also bones of St. Nicholas in Venice?]. enec.it (in Italian). Europe – Near East Center. Archived from the original on 9 December 2012. Retrieved 2 March 2017. ↑ "Ma le ossa sono tutte a Bari?" [Are all the bones in Bari?]. enec.it (in Italian). Europe – Near East Center. Archived from the original on 8 December 2012. Retrieved 2 March 2017. ↑ Seal 2005, pp. 136–137. 1 2 3 4 5 6 7 8 9 10 Seal 2005, p. 137. ↑ "Relics of St. Nicholas – Where are They?". Saint Nicholas Center. Retrieved 11 February 2014. 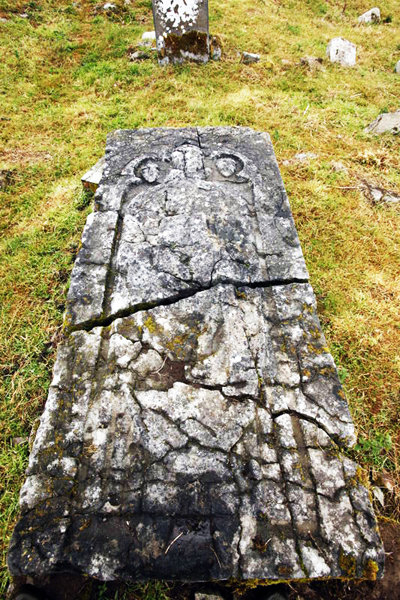 ↑ "Heritage Conservation Plan: Newtown Jerpoint County Kilkenny" (PDF). An Chomhairle Oidhreachta/The Heritage Council. 2007. p. 81. Archived from the original (PDF) on 12 October 2016. Retrieved 2 March 2017. ↑ "Anatomical Examination of the Bari Relics". Saint Nicholas Center. Retrieved 6 December 2013. 1 2 "The Real Face of St. Nicholas". St. Nicholas Center. St. Nicholas Center. Retrieved 15 December 2016. 1 2 3 4 5 6 Coughlan 2017. ↑ "Greece". St. Nicholas Center. Retrieved 12 December 2013. ↑ "Feasts and Saints, Commemorated on May 9". Orthodox Church in America. Retrieved 4 April 2012. ↑ "St. Nicholas the Wonderworker". Synaxarium (Lives of Saints). Coptic Orthodox Church Network. Retrieved 13 December 2013. ↑ "Commemorations for Kiahk 10". Coptic Orthodox Church Network. Retrieved 13 December 2013. ↑ Carus, Louise (1 October 2002). The Real St. Nicholas. Quest Books. p. 2. ISBN 9780835608138. In Myra, the traditional St. Nicholas Feast Day is still celebrated on December 6, which many believe to be the anniversary of St. Nicholas's death. This day is honored throughout Western Christendom, in lands comprising both Catholic and Protestant communities (in the Eastern Orthodox Church, the Saint's feast date is December 19). 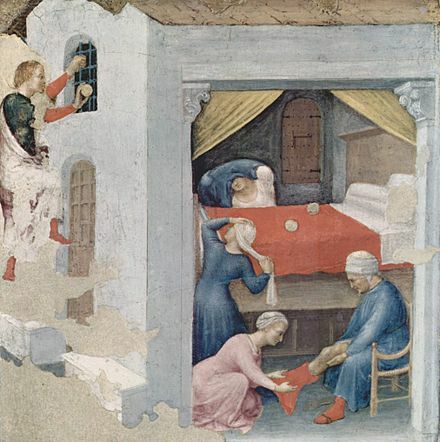 On December 5, the eve of St. Nicholas Day, some American boys and girls put their shoes outside their bedroom door and leave a small gift in hopes that Saint Nicholas soon will be there. ↑ McKnight, George H. (1917). St. Nicholas: His Legend and His Role in the Christmas Celebration and Other Popular Customs. New York: Putnam's. pp. 37–52. ISBN 978-1115125055 . Retrieved 25 August 2016. ↑ Joe Wheeler & Jim Rosenthal, "St. Nicholas A Closer Look at Christmas", (Chapter 8), Nelson Reference & Electronic, 2005. ↑ Elsie, Robert. "Scanderbeg and Ballaban". AlbanianLiterature.net. Retrieved 25 August 2016. ↑ Wheeler, Rosenthal, "St Nicholas: A Closer Look at Christmas", p. 96, Nelson Reference & Electronic, 2005. 1 2 Seal 2005, p. 111. 1 2 "St. Nicholas". St. John Cantius Parish. ↑ "Saint Nicolas / Op. 42. Cantata for tenor solo, chorus (SATB), semi-chorus (SA), four boy singers and string orchestra, piano duet, percussion and organ". Britten-Pears Foundation. 1948. Retrieved 5 December 2018. Wikimedia Commons has media related to Saint Nicholas .